Rent apartments and houses in Fuhlendorf, Germany. 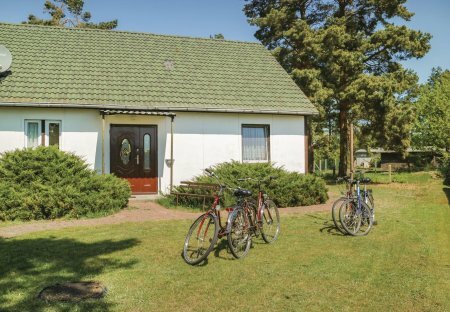 You will find your suitable furnished holiday home for a relaxing holiday in the beautiful countryside of the southern Bodden coast, vis a vis the peninsula Fischland-Zingst. These comfortable houses have large, bright rooms. The rural area and the proximity to the water welcome you for swimming, fishing, hiking and cycling. The upstairs has partially sloped ceiling. This new and modern wooden house stands on the plot of a holiday resort close to the Barth Bodden. You will holiday here on the entire ground floor. In the living area. This house stands along with other holiday homes on a shared property near the Bodstedter Bodden. These cosy homes are located on the ground floor of an apartment house, situated on a large shared property. In this apartment you will enjoy a relaxing holiday in nature. The property is located in the countryside, in the Pomeranian forests of the Nature Reserve "Boddenlandscape". Mild coastal climate. The cozy apartment is located in the countryside, in the Pomeranian forests of the Nature Reserve "Boddenlandscape". Here you will enjoy a relaxing holiday in nature. Mild coastal climate. This beautiful cottage is located in a cottage area in a quiet location in Fuhlendorf, off the main road. The view from the house. In a cottage area in Fuhlendorf this beautiful thatched cottage in a quiet location. In 2017 this was built, providing modern and quality furnishings.